While America is becoming ever more diverse, corporate America has yet to reflect this change. In particular, there is a significant gap between the rapidly growing Hispanic population of over 50 million and the very small number of Hispanics on corporate boards. According to the Pew Hispanic Center, Hispanics already account for over half of U.S. demographic growth and nearly half of consumer spending growth. Yet the Alliance for Board Diversity (ABD) found that board diversity actually decreased since 2004. In 2011, the ABD released a report called “Missing Pieces: Women and Minorities on Fortune 500 Boards” showing that Anglo men comprise 77.6% of directors and Anglo women comprise 12.7%. Hispanic men accounted for only 2.3%, and Hispanic women only 0.7%. The report also showed that among Fortune 500 boards, 37 companies have zero women or minorities on their board. Clearly, there is a significant gap between board composition and the critical mass of purchasing power and population of women and minorities, especially when it comes to the Hispanic community. HACR’s flagship event is the HACR Annual Symposium, which brings together Hispanic executives, government officials, and community leaders for two days of speakers, panels, and networking opportunities. The 20th Annual HACR Symposium, taking place this year in Chicago on April 16-17, is set to raise the bar. HACR’s focus on employment, procurement, philanthropy and governance will be reflected in a strong Symposium agenda. Panels include “The Power of Hispanic Inclusion™”, which will feature the leaders of key national Hispanic organizations including the Latino Coalition, the New America Alliance, and the Society of Hispanic Professional Engineers. The philanthropy panel, “Trends in Philanthropic Giving,” will feature speakers from notable philanthropic institutions including the Kellogg Foundation, McCormick Foundation, Anheuser-Busch Foundation, and the Ford Motor Company Fund. This year’s Symposium will also include Robert Rodriguez, the Executive VP and COO of Denny’s Corporation Worldwide, who oversees nearly 1700 Denny’s restaurants. With over 40 years of food service experience, Rodriguez has been instrumental in expanding brands nationally and internationally, and served as president of companies such as Pick Up Stix and Dunkin’ Donuts. In addition to the Symposium, HACR also has several key programs that reflect a strong pipeline of Hispanic leaders. The HACR Young Hispanic Corporate Achievers™ program features young executives who have been nominated by their companies to participate in a three-day executive leadership development program. The HACR Corporate Executives Forum™ brings together senior corporate executives from Fortune 500 companies for an annual forum that includes executive seminar content, peer-to-peer interaction, and networking. The HACR Corporate Directors Summit™ (CDS) provides corporate directors of Fortune 1000 companies an opportunity to come together for an annual summit that includes board-level seminar content, discussion, and networking. Each of these programs has an on-going network component where once an individual participates they become part of a growing network of their peers. Recently, HACR produced an award winning film called Insider Game. The documentary takes on the topic of the low level of Hispanic inclusion in corporate America. “Insider Game tells a compelling story of commitment to our community through the lens of very successful corporate directors whose commitment to Hispanic inclusion is steadfast and powerful.” said Orta. Insider Game features insightful comments and strategic observations by well-known corporate leaders such as Rocky Egusquiza, Monica Lozano, Sol Trujillo and Sara Martinez Tucker. It can be viewed at InsiderGame.org. The HACR Corporate Inclusion Index is a survey and analysis of the level of Hispanic inclusion at major corporations. HACR sent the 2011 Corporate Inclusion Index survey to 122 companies, including all Fortune 100 companies and its corporate partners outside of the Fortune 100. They received responses from 52 companies and evaluated 50 companies. The survey included questions on employment (workforce and recruitment), procurement (spending), philanthropy (community investment), and governance (leadership). Companies that responded to the survey got a “thumbs up” in the report and companies that failed to respond got a “thumbs down”. GM has 217,000 employees in every major region of the world and provides broad support for the Latino community in a number of key areas. 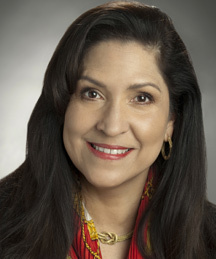 Latinos have been represented on the GM board of directors by Dr. Cynthia A. Telles since April 13, 2010. Currently on the faculty of Department of Psychiatry of the University of California School of Medicine, she was recently appointed to the White House Commission on Presidential Scholars by President Obama. Dr. Telles also serves on the boards of Kaiser Permanente and Americas United Bank. The high-rated companies deserve praise for their great work on Hispanic inclusion. The medium and low-rated companies deserve praise for having the courage to respond and be transparent. They have a scale by which to measure their progress in increasing Hispanic inclusion. There are some very large and very well-known companies that did not participate and got a “thumbs down” in HACR’s report. The full report is at HACR.org. One leading HACR CDS member is Aida Alvarez. Whether as a teacher, journalist, banker, government official, or board member, Alvarez has always had a big impact on the people and organizations around her. A native of Puerto Rico, she was an award-winning journalist, reporter, and anchor and then worked as an investment banker before going into public service as the head of the Office of Federal Housing Enterprise Oversight and then Administrator of the U.S. Small Business Administration. Always a leader, Alvarez was the first Latina to serve in a cabinet-level position in the U.S. government. Throughout her career, Aida has consistently given back to the community by serving on non-profit boards. Her stellar career made her a great candidate for corporate board service. Today, Alvarez serves as a corporate director of Walmart Stores and UnionBancal Corporation, as well as Chairman of the Latino Community Foundation. Walmart, with 2011 revenues of $435 billion, a market capitalization of $257 billion and 2.1 million employees, is one of the largest companies in the world. Alvarez is the Hispanic voice on the board of Walmart. To Walmart, the Hispanic community is a large and growing customer base, an integral part of its workforce, an important source of suppliers, and a very influential political constituency. Another HACR CDS participant is Charlie Garcia, whose professional career spans a broad spectrum of finance, marketing, and entrepreneurial ventures. Originally from Panama, he graduated from the U.S. Air Force Academy and went on to get a law degree and become a White House Fellow. Garcia founded Sterling Financial and has also been involved in public service, serving on the Florida State Board of Education, and was recently tapped by CNN as an expert on Hispanic issues.